Red Maryland recently published the results of a poll of upcoming Republican primaries. 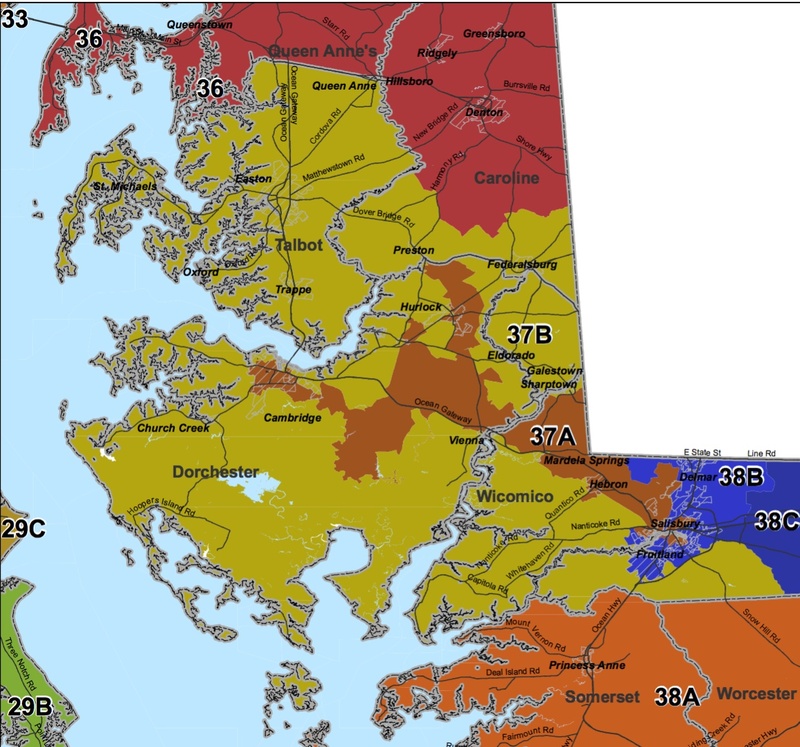 The results are in line with my recent predictions for the primaries in two Eastern Shore districts. Incumbent Sen. Steve Hershey leads former Del. Richard Sossi in District 36. Del. Addie Eckhardt has a good chance to unseat incumbent Sen. Richard Colburn in neighboring District 37. The key caveat–and why I am not making any ratings changes based on these polls–is that the number of respondents in each district is low. 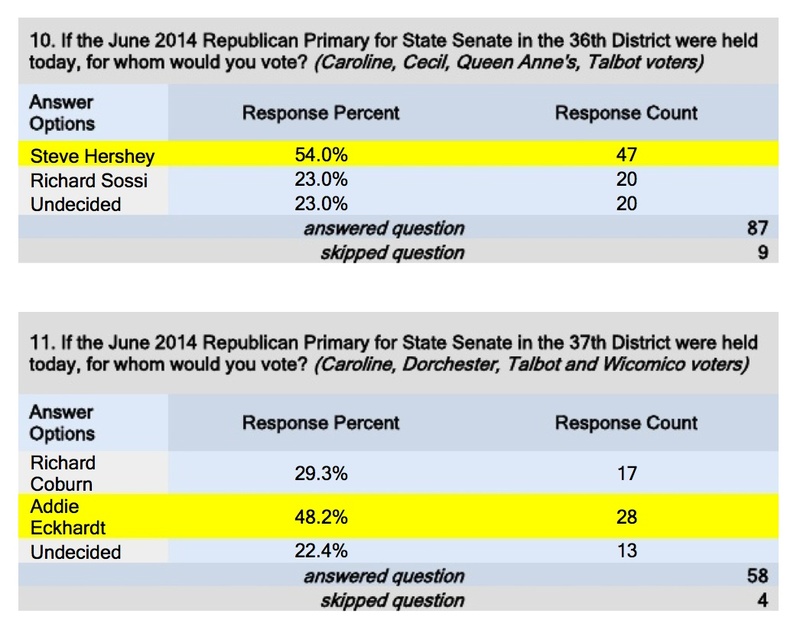 In the Hershey-Sossi race, there are just 87 respondents and in the Colburn-Eckardt race, there are only 58. Another problem is that figuring out who will vote in these low turnout events is not easy. Indeed, based on this many respondents, the difference in support for Colburn and Eckardt is not statistically significant. Put another way, there is a more than 1 in 20 chance that the difference in support among actual voters is zero or that Colburn actually leads Eckardt. On the other hand, the sample size and the differences in the levels of support for the two candidates are large enough in the Hershey-Sossi race to indicate that Sossi probably really does trail Hershey. The small number of respondents renders the actual size of Hershey’s lead unclear–the range around the estimated level of support for either is huge. But one can say that Hershey is ahead by some amount greater than zero with reasonable certainty. This is the third in a series on the top Senate primaries in the State (Part I and Part II). Colburn was elected in 1982 to the first of two terms in the House of Delegates. In 1990, he sought the Republican congressional nomination and came in third with 12% of the vote in a highly fractured contest. When very conservative Democratic Sen. Frederick Malkus, Jr., retired, Colbun won election to the Senate in 1994, easily winning the primary and then the general by 10%. Eckardt is the most serious challenger Colburn has faced since gaining his Senate seat. Beyond being smart and likeable, she has also represented most of the same people as Colburn for nearly two decades. They are both known quantities. Colburn also goes into the primary with less money than Eckardt as he has $32K in his campaign account to her $44K. Neither can raise money during the session, so they will have little time to raise much more before the primary occurs in June. One advantage held by Colburn is that he already represents all of District 37. Eckardt represents District 37B, which elects two of the three delegates. Much of the advantage, however, is illusory. District 37A was drawn as a majority-black district, and so has comparatively few Republicans. In 2012, only 18.5% of registered Republicans lived in 37A–only around one-half what one would expect if Republicans were evenly distributed. On top of that, Colburn has had a very public divorce with allegations of an affair with his aide. His now ex-wife was even thinking of running against him but agreed to support him politically once they agreed to a divorce settlement. Eckardt also appears more respected in the General Assembly than Colburn. While the number of Republican senators remains few, Colburn has somehow never managed to hold a Republican leadership position according to his bio. Eckardt chaired the House Republican Caucus for five years. However, it’s well known that a lack of respect in the Assembly often has little relation to political support at home. Yet, she remains a firm conservative, especially on social questions. Colburn tends to position himself more as a regional champion, playing on the Shore as a victim of the State. Needless to say, this will be an exciting contest. They’re both from Dorchester so neither has a home bailiwick. If anyone can topple Colburn, it should be Eckardt. Both seats in 37B will be open, so this race will likely feature high turnout amid an unusual level of interest in state legislative contests. Rating: Toss Up. UPDATE: A friend on the Eastern Shore says that Colburn provides very good constituent services and has a reputation of being very responsive to individual requests, which will aid him in his hour of need in this tough primary.